Hamamatsu, Japan, September 1, 2016 – Roland DG Corporation, a leading manufacturer of wide-format inkjet printers and printer/cutters worldwide, today announced the launch of the SG-540/300 54″ and 30″ entry-level wide-format eco-solvent inkjet printer/cutters, the latest additions to its TrueVIS brand. The new TrueVIS SG series is designed to deliver the rich colors and glossy finish required for high-impact printed graphics at a very affordable price point. Launched in March 2016, the TrueVIS brand is Roland DG’s newest generation of inkjet printer/cutters, combining its proven technology and expertise developed over many years in the sign and graphics industries. 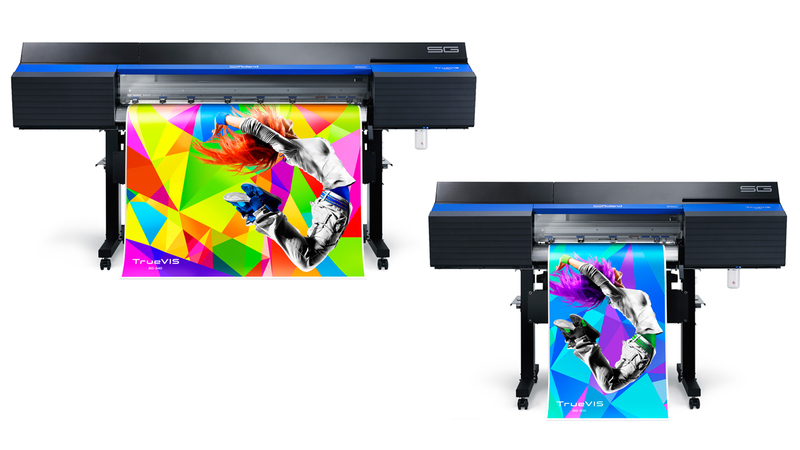 As part of the TrueVIS family, the SG series offers extreme color quality, versatility and ease-of-use with significant enhancements: new Roland DG FlexFire print head, new 4-color TrueVIS INK, advanced integrated print & cut technology and a host of additional state-of-the-art features. The SG series is available in both 54″ and 30″ models for producing indoor and outdoor advertising, vehicle graphics, banners, posters and displays, as well as labels, decals and apparel heat transfers. Two Roland DG FlexFire print heads fire precision droplets in three sizes and a wide print swath, for high-quality output and efficient ink usage. Every drop of ink falls exactly where it is intended, delivering beautiful images and uniform colors. The combination of TrueVIS INK, engineered specifically for the FlexFire print head, and Roland VersaWorks Dual RIP software results in stunning fine details and vibrant colors at production speeds. The SG series’ added productivity – up to 60% faster than previous comparable models in standard mode – enables increased profitability. TrueVIS INK is the next evolution for eco-solvent ink technology, meeting user demands for competitively priced ink with low consumption and a wider color gamut while also meeting strict environmental standards. TrueVIS INK comes in cost-effective 500cc pouches that fit neatly into reusable cartridges that slide into a hidden ink bay for clean, safe use with less waste. Roland DG introduced printing and cutting technology in 1996. The SG series represents Roland DG’s most advanced integrated print/cut technology to date. A new cut carriage and blade holder with increased downforce and accuracy facilitates using a wider variety of media for additional sales opportunities. The SG-540/300 is incredibly user-friendly for all operators from novices to seasoned professionals. New Roland VersaWorks Dual RIP software is included and features a new core engine that quickly and accurately processes both native PDFs as well as legacy PostScript files, including files with transparencies. In addition to a built-in control panel, a new Roland DG Mobile Panel enables users to manage the printer functions remotely using a smartphone or tablet with a Bluetooth connection.